Our new Website Usability Testing service offered via Websitefeedback will help boost your website’s conversion rates and ensure your SEO campaign reaches its full potential. Regardless of how much time and effort you invest in the process, Search Engine Optimisation (SEO) is only ever one piece of the puzzle. After all, it’s not like you’ve sealed the deal just by getting the traffic to your website in the first place – how about making those essential conversions? If your site annoys, irritates or in any way obstructs your visitors from achieving their goals, they may as well never have found you in the first place. By contrast, deliver a polished and professional experience from start to finish and they’ll be eating out of the palm of your hand! This is precisely where Usability Testing comes into the equation, which is by far and wide the most effective and efficient method for identifying any problems or inconsistencies that exist within your website, enabling you to put them right as quickly as possible. 1. Set a Task – Describe what you want the testers to do on your website. Don’t worry, if you don’t know what to tell them, we have ‘Task Templates’ that can help you get the best out of the test. 2. We Find Testers – Let us do the hard work for you! We will recruit high quality users from our panel that meet your specific requirements! 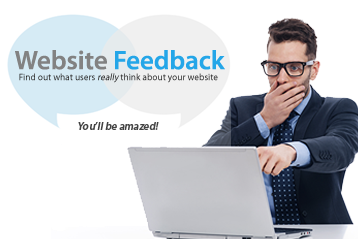 If you’re looking to boost the user experience on your website and improve sales conversion, WebsiteFeedback can save you a lot of time, resources, and money. Give it a go!